1st Lt. Charles B. Gatewood: That's more of a lynch mob than a posse. But if they serve those warrants, I'll have to give you up. Geronimo: You have a good long glass, Gatewood. If I scare them off, we trade. Courtesy of Erato Disques S.A. The valiant, if doomed, Chiricahua Apache tried (as did so many other tribes) to be accommodating after being hounded to the breaking point. Their famous chief, Geronimo, gave himself up voluntarily and tried to lead his people onto the reservation. But, as happened so many times, even after capitulation they were attacked in unwarranted fashion and reacted by leaving the reservation whereupon they were hunted, and hunted, and harried. 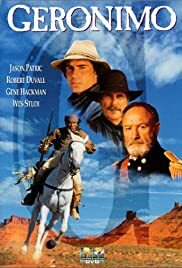 Some people don't like this film because it tells history more like it was than most movies do about the "conquering" of the American west ... it shows both sides of the story, not just one. With this movie, you can't identify with the hero on one side and the villain or the other. Both are sympathetic, both are reprehensible (isn't that the way a historical drama really ought to be played? In my book, this is a plus). As a native of Arizona, where much of the historical action took place, I find it disturbing that the countryside in which the movie was made is either in some other state or in the wrong part of Arizona, that characters seem to be able to get from Tombstone to San Carlos in one day on horseback (either they had multiple horses, or one dead one), and that there is a bit of overstatement about the honor among the various Apache bands (with reference to the reason that members of some Apache groups served as scouts against other groups). 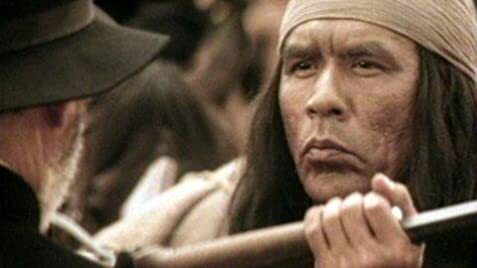 All in all, though, I vote for this one over all the other "Geronimo" movies that have been made.